Once again Viswajyothi proved that there is room for anyone who hunts for chances. The 5th Aqua swimming tournament was inaugurated on 15th February 2016 by Mr. Mohan Mathew, the Principal of Vidhyadhiraja Vidhyabhavan. The first event of swimming was flagged off by Mas. Binil Manjaly, our ex-student and receipent of the Prime Minister’s bravery award for children 2016. Mrs. Jade, the NBA Coach from USA visited the school as part of giving special training to School Basketball Team. The 11th All Kerala Viswajyothi Inter School Chess Tournament for Mast. Sarath Memorial Trophy was inaugurated on 14th October by the Chess Association President Mr. A.M Kunjumoideen. Devamata CMI Public school, Thrissur bagged the overall trophy with 125 points and St. Joseph’s Convent English Medium School, Pulluvazhy bagged the first runner up trophy with 113 points. Mr. Roji M John, MLA, Angamaly gave away the prizes to the winners. 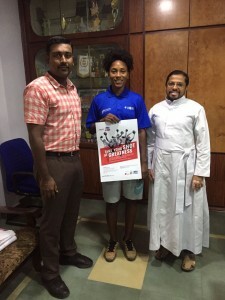 The 15th All Kerala Viswajyothi Basketball Tournament for Rev Fr. John Pynadath Endowment Ever rolling Trophy- 2016 was inaugurated on 4th August by renowned badminton player and the recipient of Arjuna Award Mr. George Thomas. .He emphasized the importance of sports in the present day life. In the valedictory function on 7th August, the Chief Guest Mr. Y R Restem, Rural D Y S P, Aluva distributed the prizes for the overall Champions. St Ephrem Mannanam bagged the trophy for boys and L.F. Koratty bagged the trophy for girls team. The school hosted the Central Kerala Sahodaya Basketball Tournament on 3rd and 4th August 2016. In the breath taking finals, Santhal Jyothi Public School won the overall trophy for the boys’ and girls’ category. The Arjuna Award Recipient Mr. George Thomas honoured the winners. The school hosted the Central Kerala Sahodaya Football Tournament on 15th October. Mr. Benny Moonjely Municipal Chariman, Angamaly inaugurated the match. 34 teams from Central Kerala Sahodaya participated in the tournament. In the final match on 19th October, Viswajyothi CMI Public School defeated St Philomena’s Public School and Junior College by 5-0 and emerged as winners. The school hosted the 7th Central Kerala Sahodaya Throw ball Championship for Girls on 15th October. Mr Benny Moonjely, Municipal Chariman, Angamaly inaugurated the match. 10 schools from Central Kerala Sahodaya participated in the championship. The vigorous and vibrant girls of Viswajyothi CMI Public School throw ball team under the captaincy of Rose Martin lifted the glorious Championship Trophy.